Dash cam apps are designed to essentially turn your phone into a dash cam, saving you the cost of purchasing a hardware dashboard camera. Top rated apps provide all of the same basic functionality that you see in mid-range hardware dash cams, with the notable disadvantage of requiring you to activate the app and place your phone in an appropriate cradle every single time you drive. Some dash cam apps compare more favorably to various hardware types of dashboard cameras than others, and there are even some apps that provide functionality that you can't get from a physical device. For instance, some dash cam apps are actually capable of tying into an OBD2 Bluetooth scanner for a totally different experience from anything you can get out of a hardware dash cam. So while these apps aren't always as convenient as a hardware device would be, they are the most useful dash camera alternatives available. There are a lot of dash cam apps out there, far too many to examine each one individually, so we'll just take a quick look at five of the highest-rated dash cam apps available for Android from the Google Play Store. The included ratings are from the Google Play Store and represent actual user opinions on the functionality and value of each app. Most dash cam apps are available for both iOS and Android, and many are also available for Windows mobile devices, and the dash cam features to look out for are the same regardless of your mobile OS of choice. Note that many dash cam apps can be operated when not actively in focus, meaning that they are capable of recording when there is absolutely no outward indication that your phone is recording. This makes some of these apps suitable for use as spy cams, but completely aside from the question of whether dash cams are legal, it's important to remember that recording people without their knowledge is illegal in a lot of places. Runs in the background while other apps are active. Automatically records when connected by Bluetooth or placed in a car dock. No options to upload video to cloud services for storage. Time is not stamped on recorded videos. AutoGuard is a dash cam app from Hovan Yoo that has both free and premium versions. The free version is supposedly ad-supported, but no ads are visible on the main screen during recording. The paid version's ads feature​ things like the ability to sync videos to YouTube and run AutoGuard in concert with other apps. While most dash cam apps show a view of the road, or whatever you're recording, just like hardware dashboard cameras, some of them can also run in the background. AutoGuard is an example of a dash cam app that can run in the background, and the paid version can even run at the same time as other apps. So if you have a navigation app, you can leave the dash cam going while you use it. You may even be able to have a small picture-in-picture view of AutoGuard in the corner while in other apps, depending on your hardware. One of the main problems with dash cam apps versus hardware devices is that you have to set the app up every time. Some dash cam apps, like AutoGuard, make that a little easier. When you place your phone into a car dock, an app with this functionality will automatically turn on and start recording. Small amount of cloud storage space. Can't store video on attached SD card. GPS navigation is not as good as dedicated GPS apps. CamOnRoad is a totally free dash cam app from Castarama Ltd. that doesn't have a premium or paid version. Castarama also provides 2 GB of cloud storage for dash cam recordings free of charge to registered users. 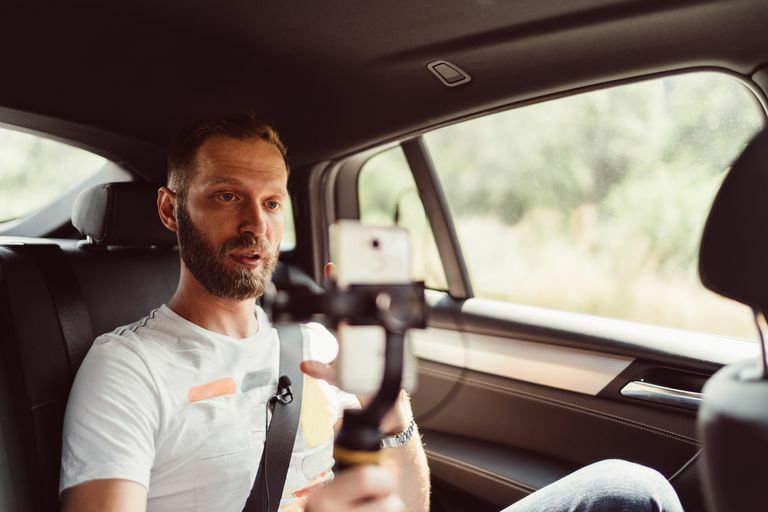 Although dash cam apps will never be as convenient to use as hardware dashboard cameras, CamOnRoad is an example of an app that does something no physical device can. In addition to turning your phone into a dash cam, it also has integrated GPS navigation functionality. Some dash cams come with built-in GPS to prove where a particular accident happened, but they don't actually provide directions like a real GPS unit. Set g-force sensitivity to record when triggered. Video protect feature preserves recordings such as accidents. Ads in the free version. Drains battery quickly, deactivate when not using so it doesn't run in the background. DailyRoads Voyager is a dash cam app from DailyRoads that is available in both free and paid versions. The free version is ad-supported, although no ads were immediately visible on the main recording screen, and all ads disappear if you make a donation or in-app purchase. DailyRoads Voyager includes a standard feature set like looped-recording and allows you to set the length of the loops and how much total storage space gets used before old recordings are overwritten. It also uses your phone's GPS and g-sensor to work just like a hardware dash cam, and you can even configure the sensitivity of the g-force necessary to trigger a recording even. This app can also be run in the background with optional video/photo capture buttons that can be superimposed over other apps. Turn off the screen display while recording. Collision detection for recording events. Distracting ads in free version. Cannot run in the background. Phone can get hot while in use. Smart Dash Cam is a free dash cam from IP Cam Soft, which also makes apps for IP cams. It features auto-loop recording, integration with Google Drive for cloud storage, and a collision detection feature. Unlike other highly rated free dash cam apps, Smart Dash Cam is ad-supported, which means there is a large banner ad on the screen whenever you use it. While this seems jarring, it's important to note that you really aren't supposed to be watching the screen of a dash cam while you're driving, so the ad might look tacky, but it isn't covering up any vital information. While there is no paid version of Smart Dash Cam in the Google Play Store at this time, you can buy a premium, ad-free iOS version of the app for $2.99.